GET READY TO PARTICIPATE IN JOTA-JOTI BETWEEN 20-21 OCTOBER 2018! 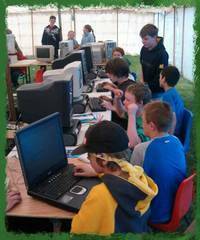 Jamboree On The Air (JOTA) and Jamboree On The Internet (JOTI) is an annual virtual global camp in which around 500,000 Scouts and Guides from all over the world make contact with each other by means of amateur radio and the internet. Through JOTA-JOTI every Member of Scouts Australia can make friends, exchange stories, experience different cultures and have fun as part of the largest activity in world Scouting. JOTA-JOTI also gives Youth Members an awareness that they belong to a worldwide Movement. You don't need any technical knowledge to join in - just ask the right people to help you. Anyone with an average knowledge of computers can help you organise and run JOTI - all you need is a computer that's connected to the internet. To participate in JOTA you must have a licensed Amateur Radio Operator to assist you. There are around 15,000 of these in Australia, and your operator will provide all the necessary equipment and expertise. There are no registration or fees required for your Group to participate, however we are required to prepare Branch and National reports on the event, and some form of registration of your participation will assist greatly. More on this later. Set the weekend aside now in your Group and Section calendars, watch this site and Branch newsletters for more information, and if you have any questions contact your state coordinator or email jota.joti@scouts.com.au.